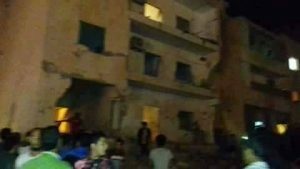 More death and destruction came to Benghazi today when three civilians were killed in a rocket attack and four sappers perished when a mine exploded while they were tackling it. The civilians were killed when a rocket hit a building in Shibna which is part of the city’s Hay Dollar district. Accounts differ on the number of wounded but between seven and 14 people were take to Al-Jalaa hospital, some wth serious injuries. It is reported that militants are claiming the rocket attack was in retaliation for air strikes on their positions in Sabri during which some of their number were killed. There is less information about the death of four mine clearance experts in Sabri. The men from the Libyan National Army (LNA) engineers were trying to defuse an explosive device when it detonated killing all of them.